There are plenty of cool variations of the pedal hop. It's one thing to cross a gap in a straight line, but in some biketrials situations, you won't have any room for landing frontaly. One option is to turn in the air, while crossing a gap, and land in a different direction that will allow a proper landing, or ease the next step. You can turn by twisting your whole body from the waist up, before take off from the rear wheel position. 1° Like for any odd pedal kick, balance on the rear wheel before you lower the front. 2° Before you kick, move off-center from the bike, opposite the direction you want to turn. 3° Start kicking progressively, while turning the bars to build some rotation momentum. 4° While kicking the pedal, finish your extension with a twist of your shoulder and bars, spiraling upwards to face in the direction you want to turn. 5° In the air pull up the bike with you while following your shoulders' rotation. With your kicking leg in extension, also push the bike in a rotation. 6° Realign the bike in front of you as much as you can (you started off-centered), using as much grip as you can from the pedals to land straight backwards. Even if you land twisted, try to absorb the impact for a smooth landing, and use the first tyre bounce-back to correct your balance. See the move in a slow-motion video. Chain up these transitions to bounce around (endlessly). Don't wait to be in the air to pull on the handlebars. The whole movement is "programmed" during take off. Ok, the demo is about 180°, but aim at small angles of 90° or less to feel the move. You can turn both directions. Though it is typically easier to turn on the same side as the driving pedal because your weight distribution is not symmetrical during the move, and your are already leaning on this side when you kick in the pedal. So it only takes a little extra effort to spin the bike along your stretched-leg axis. Whereas if you turned in the other direction (towards your bad foot), you would be trying to rotate around an axis off-centered from your center of gravity and that makes it really weird for turns larger than 90° (wicked TrashZen theory anyway). Once you have enough rotation inertia built up during the jump impulse, you can fine tune your landing in a precise direction by realigning the bike more or less, beneath you. Think that the bike only represents about 15% of the total mass (pilot+bike) moving around, so it will follow pretty much any body momentum you can build during your take off. You can also cross a gap sideways, with a 180° turn in between. Again for this move, rather than turn on your most probable good side (opposite the pedal kick), try to turn on the same side as the driving pedal (you can use more of your momentum and weight shifting on the pedal kick to turn inside and this helps a lot). It is a very classy turn, that you can nail onto the front wheel like when climbing or flying over a gap to front-wheel. You could even try to land on the rear wheel and carry-on spinning (though it works best on a mod or a short bike). 1° Align your wheels and stay in balance until you are ready to commit to the move. 2° Preload the pedal, fold on the bike to prepare your extension, focus on the turn. 3° While kicking, start your extension with a flick of the bars to pull the rotation. 4° Carry-on your extension with a twist of your shoulders and bars, spiraling upwards in a turn to face the direction you are aiming at. 5° In the air pull up the bike with you while following your shoulders' rotation, and spin the bike over your driving leg, to complete the rotation. 6° Realign the bike as much as you can with your shoulders (using as much grip as you can from the pedals), and land firmly on both wheels. Even if you land twisted, try to absorb the impact for a smooth landing. See the move in a slow-motion video. 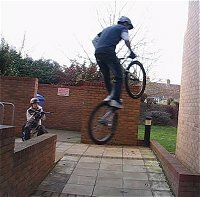 While you are at it, you can even 180° sidehop onto an obstacle, just to make it more interesting. The move is really a combo of a sideways turn with a pedal kick while landing to front-wheel. Once you have kicked in the pedal and spiraled upwards with your shoulders (trying to look back), focus on your front-wheel steering, to land it right. The bike will follow your momentum if you pull the bars with you and nail the front wheel.